Our Wearhead Church and indeed the Westgate Station, suffered a great loss in the death, at the age of 71, of Mrs. Featherstone, of Wearhead, the widow of the late Joseph Featherstone. She was, indeed, one of the excellent of the earth, a saintly character, a generous supporter of our cause, and her constant kindness and hospitality were most widely known by large numbers of our ministers and others throughout the North of England. She was the daughter of George and Mary Harrison, of Wearhead. Her parents were of the best type of Weardale Primitive Methodism; her father who lived to see his 87th birthday, being a class leader and official for over sixty years, and their house being the constant resort of our preachers. The late revered Thomas Greenfield, who was as remarkable for his excessive modesty as for his exceptional abilities, in those early days laboured on the Westgate circuit, and entertained serious thoughts of abandoning the ministry. Probably Primitive Methodism owes more than it knows to Mrs. Harrison for the tactful and motherly encouragement she gave to Mr. Greenfield to remain at his post. Thus our sister was brought up breathing the air of piety, and joined our Church when but a girl. In due course, upon the removal of the family to Side Head, Westgate, she married Mr. William Walton, of Stone Carrs, a member of our Church at Westgate. Their union was not a lengthened one, for Mr. Walton died in early manhood. A few years later our sister married the late Mr. Featherstone, of Wearhead. Mr. Featherstone was one of the principal officials of the Westgate station, his name being frequently bracketed with that of the late George Race by those who have traced the history of the circuit. Her “Missionary Basket,” containing her gifts of made-up garments, etc., which she and her husband sold for the Missionary Fund, raised on an average £10 a year for many years. But these occasional services to the Church were only samples of her constant devotion to all its interests; while the very memory of her saintly life, with its intense religiousness, will be a rich heritage to the Church for many years to come. She was a most constant attendant at the class meeting and week-night religious services, as well as those on the Sabbath. Her ill-health frequently led her dearest friends to endeavour to restrain her from attending, but they seldom succeeded. About 25 years ago her eyes became injured, probably by overtaxing them in connection with bazaar work. In course of time the slow growth of cataract occasioned her frequent pain in her last years. Since the death of her husband, about eight years ago, Mrs. Featherstone has gradually failed in health, but her declining years have been spent in the tender care of her daughter, Mrs. Ridley, while fortunately her two remaining daughters, Mrs. Emerson Phillipson and Mrs. T.J. Watson, have never been far from her. A large concourse of people attended her funeral at Wearhead Cemetery on July 4th, 1900, the interment being conducted by Revs. W.D. Judson and R. Huddlestone, the circuit ministers. Ann was baptised on 27 June 1829 in the parish of Hethery Cleugh, Co. Durham. 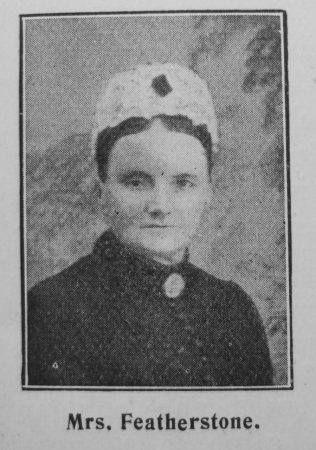 Her father George was a lead miner. She married William Walton in the summer of 1851 in Weardale, Co Durham. Census returns identify two children. Ann married Joseph Featherstone (1826-1892), a grocer and draper, in the spring of 1863. Census returns identify one child.